Our annual helping of spooky local stories . . . one from Alvechurch and two taken from Anne Bradford’s collections. “When my story begins I was about 15 or 16. My father was working nights at the old Austin factory, cycling there and back again from our house in Barnt Green. About two years afterwards, when I was about 18, I used to follow Birmingham City Football Club, travelling to places as far away as Ipswich. When you got back late on a Saturday night you could only catch a bus to Northfield, so I then had to walk from Northfield to Barnt Green. 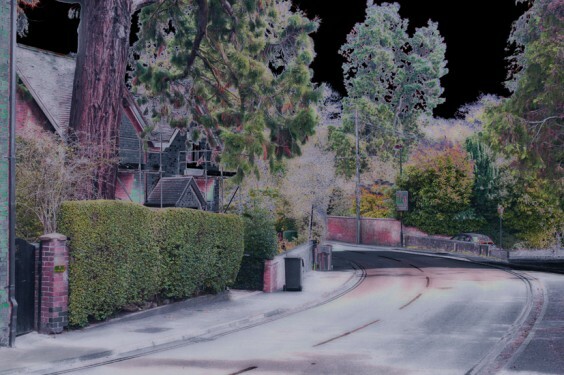 One night, I was walking along the old road from Rednal to Barnt Green, approaching Barnt Green House. I had just passed the cricket club, then a dip in the road and a nasty bend, and I was about 100 yards before the entrance to the house, when a white figure crossed the road. She walked through the hedge, right by an oak tree (which incidentally is still there). She was tall and thin and quite solid, she wasn’t floating and seemed to be walking quite normally. Then she walked through the hedge. I wasn’t frightened, just curious, so when I got to the bit where she had gone through the hedge I stopped and looked over the hedge. At first I couldn’t see her and thought she had disappeared, but then I did see her. She had gone down into a hollow out of sight and come up again. Where the figure went down is the River Arrow, opposite Barnt Green House, and she reappeared on the higher ground on the other side of the river. She had followed the ground down, walked straight through the river and up. I stood watching her for about five minutes. Then suddenly, I remembered. When I was at Barnt Green School, in one of our history lessons we had been told that there is a tunnel between Barnt Green House and Cofton. We had been taken into the house and shown the entrance to the tunnel which was bricked up. Then we had been taken to the crypt in Cofton and shown the other end of the tunnel, which again was bricked up. It clicked! I realised that the white lady was following the line of the tunnel above ground. I got home and when I saw my dad the following morning at breakfast I was able to tell him that I had seen the ghost as well. Taken from Anne Bradford’s forthcoming book, Haunted Pubs of Worcestershire. “Our houses were built in the 1850s or 60s, for the workers at the flour mill (now The Mill clinic), and were then extended so that some rooms are about 120 years old while others are 150 years old. The cellar entrances are located where the original front doors used to be. It all started when my children were very young and we were at home in the daytime. A strange noise used to come from the hallway, by the door to the cellar – it was a rustling sound, as if someone was scrunching up paper. But of course there was nobody else at home. This went on for years, but when my children grew up and left home, it happened much less frequently. However, in the house next door – which is a mirror image of ours – my neighbour experienced the same thing! My husband’s parents used to live in that house, and when my father-in-law died we sold the place. One day I asked the new occupant if everything was all right, and she wasn’t sure whether to tell me at first, but eventually she said that she kept hearing a strange rustling, crunching sound in her hallway. Her child’s pushchair had also been pushed over in the middle of the night. She wondered if it was linked to the fact that my father-in-law died in the house, but of course it was nothing to do with that, since I heard the noises while he was still alive. “The house was probably built in the early 1930s but there had been a house on the site before then. I was working in front of the garage, cleaning the car or the mower or something like that, when I saw an apparition. She would be approximately 20 feet away. She walked across the drive, right across the end of the car park and into the garden. I saw her very clearly. She was dressed in mediaeval costume, rather like Nell Gwynne. She had fair hair which, as far as I can remember, was hanging straight down, and she was middle-aged. She was dressed in pastel colours, pale green and pinks. I saw her again perhaps about six months later, when I was out on the car park. Three other people also saw her. A friend of mine was here one day and he couldn’t believe his eyes. A couple of years later we had some work done on the house and the two workmen on the roof spotted her. From Ghosts, Murders & Scandals of Worcestershire by Anne Bradford. Anne Bradford’s books are available to buy from http://www.huntendbooks.com or at good local bookshops. If you’ve got a ghost story to tell, let us know at the usual Village addresses!